Plans to bring back trams to the city of Bath are to be investigated by the local council. Bath and North East Somerset Council (Banes) has announced it is funding a short study into the feasibility of a light rail tram system in the city. The authority said the decision was in response to suggestions from the public, made over the past year for a review to be carried out. The feasibility study is due to be completed by the end of March 2018. 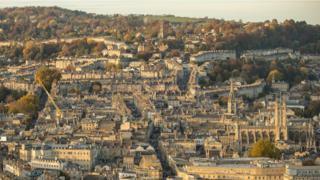 The Bath tram system was closed in 1939 but with congestion "one of the biggest issues" facing the city, the authority said it was "keen to look at ideas and solutions". Although, trams do not currently form part of the council's formally adopted transport strategy a council spokesman said it was keeping "an open mind". Councillor Anthony Clarke, cabinet member for transport, said: "The idea of introducing some sort of a light-rail system in Bath has clearly caught the imagination of a number of people in the city and we feel this idea warrants further investigation. "It's important to stress that this is a very early-stage study, but it is an important first step towards looking at this idea more seriously."